What's The Difference Between Aftermarket Mods And Factory Mods? The car on the top is a C63 AMG Black. It is a Mercedes C-Class with a bigger engine, revised suspension, and revised bodywork. The car on the bottom is the Brabus Bullit. It is a Mercedes C-Class with a bigger engine, revised suspension, and revised bodywork. How are they different? Obviously, one is made by aftermarket tuner Brabus and the other is made by Mercedes' in-house tuner AMG, specifically their Black Series skunkworks team. 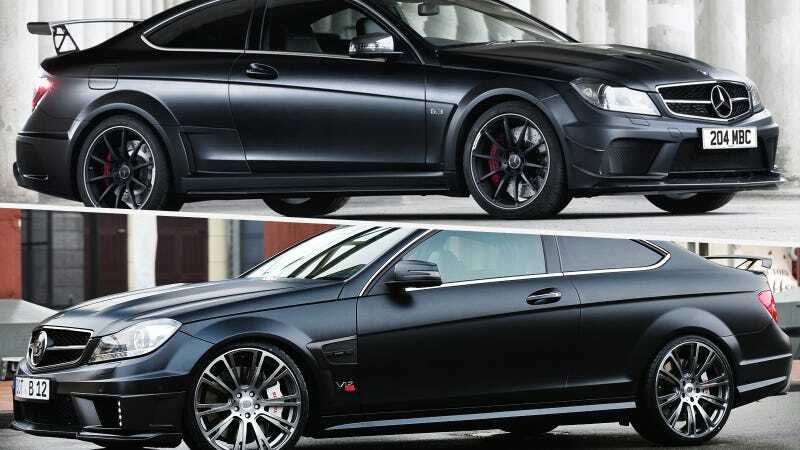 Why do most people look down on the Brabus as a tuned ride, and accept the Black Series as a standard, factory car? Why is the Brabus a "modified" car, and the AMG isn't? What, exactly, is the difference in how people perceive these two Benzes? This question came up when we asked what cars should never be modified. Victorious Secret pointed out a number of cars modified at the factory, and everyone else questioned if we should consider those cars modified at all. What Cars Should You Never Modify? Nothing is a perfect example from the factory. If the F1 was perfection, explain the F1 GTR, F1 LM, F1 GT. If the 911 GT2 is factory perfection, what is the GT2 RS? Perfection is just a plateau till you find another way to raise the level again. Gamecat235 didn't think VS was right, exactly. I disagree. sort of. Your examples are factory mods, by the manufacturer. This isn't modification you speak of. This is evolution. I agree with gamecat on this one, all the ones you listed where done by the factory. Let's try to pick them appart. The F40 LM was designed for racing whereas the F40 was just a brutal roadcar. Hence the F40 LM's huge wing attachment, fixed lights, and more power. The LM was no longer a semi-civil street machine but a LeMans contending champ built by Ferrari itself. The F1 GTR was created because the F1 couldn't use its ballistic top speed on every track so McLaren built a race-purpose machine with greater downforce-producing body, less weight, and shorter final gear. The Longtail was just a factory evolution designed to try and keep up with the 911 GT1 and the CLK-GTR. The 5 LM's were built as a celebration of McLaren's win at LeMans by creating a road-legal version of the GTR. The 911 GT2 RS has the same explaination as the GT3 RS, owners wanted a more serious track-ready Porsche. The GT2 and GT3 were great cars and could still be driven on the streets without ending up like James May in the Aston Martin N24, but the RS got rid of all those comforts for owners who wanted a no-compromise racecar for the street and track. All of those cars were built in the manufacture's factories, therefore aren't "modified" since they were done in-house instead of by tuners or aftermarket companies. Tobythesandwich disagreed with Gamecat and daender, though. Still modified. Whether you call it an evolution or not. The fact remains that they modify the car because there is better technology to be put in it. So do you think that factory-modified cars should count as modified cars? How do you consider a factory tuning shop different from an aftermarket tuning shop? There are a lot of practical differences of course, and different mission statements and profit goals, but what about perception? How should we think about aftermarket mods versus factory mods?